Every year it’s the same story for Memphis. They keep more or less the same core of players intact and it’s never enough to get them a championship. The Grizzlies are arguably the last team in the NBA basing their offense on two dominant front court player and no matter how hard Marc Gasol is trying to reinvent himself, it simply isn’t enough in an NBA where basketball is played further and further away from the basket. Memphis needs to pull a rabbit out of their hat and for several reasons, I just don’t think they’re ready to do that. So much of their identity rides on Zach Randolph and Tony Allen, they’re not going to switch them up for more versatile players. They’re caught in a comfortable dead end that is always going to end maximum during the conference finals. I hate to break it to you guys, but the Memphis Grizzlies are NOT title contenders anymore. The Grizzlies need to shed an asset in order to shore up their perimeter offense and they are a team relying on the strength of their culture too much in order to try something limber. This team has sucked for so many years, they’re just happy to be very good right now. 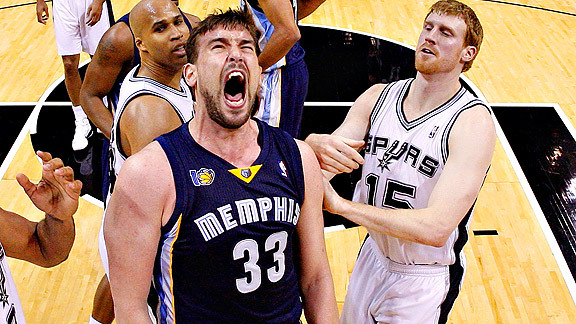 As great as Zach Randolph is, Marc Gasol working with a stretch 4 would do wonders for the Grizzlies. As a fan I love the player, I love the culture, but the spectacle on the court could be better. Memphis’ championship window is closing out, guys. Say your goodbyes to the greatest blue collar squad since the ’04 Pistons.